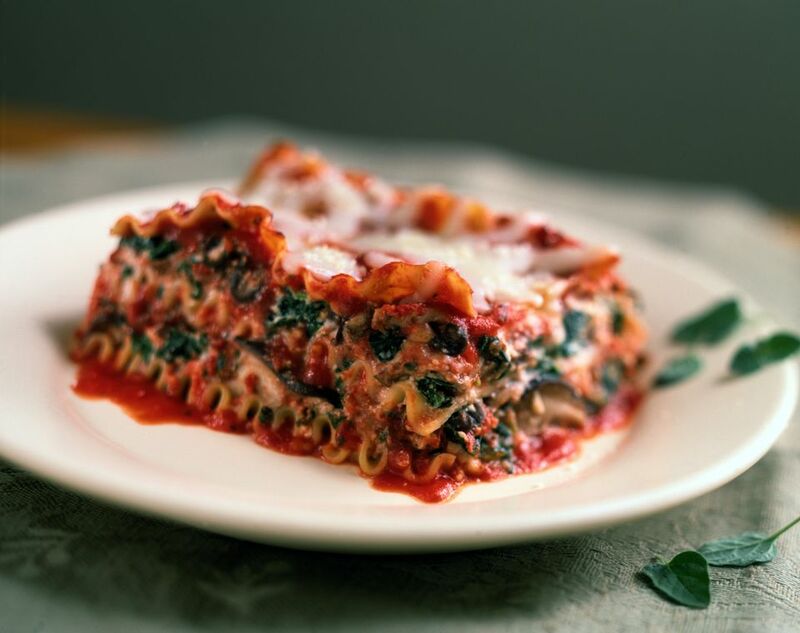 You wouldn't think that lasagna could be a lean and delicious dish until you have tried this low-calorie spinach lasagna recipe. You can see from the ingredient list that it doesn't even take a whole lot of ingredients to make up this yummy dish. And the ingredients that are included are relatively lean. Instead of fatty sausage and beef, the bulk of this lasagna filling is part skim mozzarella, low-fat cottage cheese, and spinach which give the lasagna nice texture and color. There aren't too many calories coming from those ingredients! Another great thing about his spinach lasagna is that this lasagna recipe is so easy to throw together about an hour and fifteen minutes before dinner. And the majority of that time is the lasagna cooking, which frees you up to do other things. There is no need to precook the noodles. You will add water to the dish once you have layered the lasagna together, using uncooked dry noodles. Then the water will cook the noodles during baking time resulting in perfectly al dente noodles when it is finished. One less pot to wash when it is all finished is certainly worth it. In a large bowl, combine the cottage cheese, parmesan cheese, spinach, 3/4 cup of the shredded mozzarella, pepper, oregano, and salt. Use a large spoon to gently stir together the mixture until it is well combined. Next, spray a 9x13-inch pan with cooking spray. Place 3 of the uncooked noodles in the bottom of the pan. Top with half of the cottage cheese mixture, and use a large spoon or a spatula to gently spread the cheese mixture over the noodles, trying to cover all the noodles. Next, over the cheese and spinach mixture, spread 2/3 cup of the marinara sauce, and then top the layer of marinara sauce with 1/4 cup of the shredded mozzarella. Repeat the layers two more times. End with the last three noodles, topped with 2/3 cup of sauce and 1/4 cup of mozzarella cheese. Now that the lasagna is assembled pour 1 cup of water around the edges of the pan gently and slowly, allowing the water to fill in the gaps slowly so that it does not overflow. Cover the pan tightly with tin foil. Place the covered lasagna in the preheated oven, and bake for 1 hour. Once the lasagna is done cooking, remove it from the oven, and loosely uncover the dish while the lasagna cools. Let the lasagna stand for 10 minutes before serving to allow the lasagna to become far easier to cut.